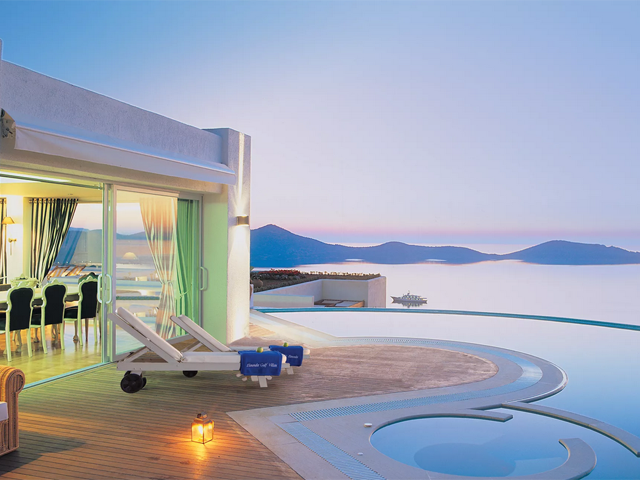 What better place to choose than the Aquila Elounda Village in one of the romantic, secluded Luxury Accommodations? The sparkling blue sea, twinkling stars, sensuously decorated guestrooms and discrete service will make your holidays a once in a lifetime experience. Luxuriate in a romantic breakfast served on the seclusion of your veranda before soaking up the sun by your private pool. 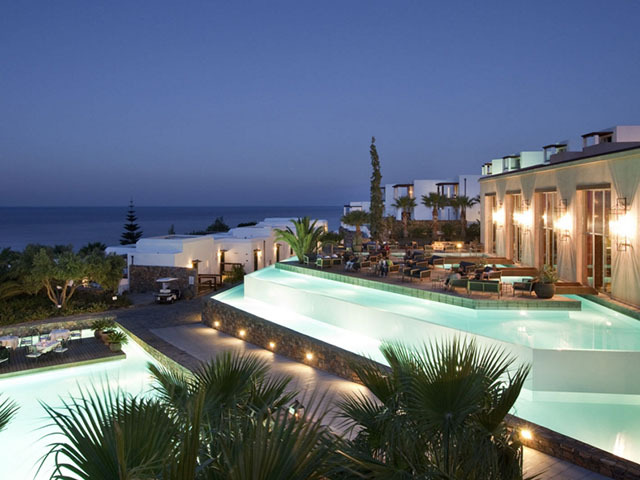 Later in the day, explore the Cretan village area with its private church, while the sun sets, go for a wander hand-in-hand along the shoreline until you reach the Mirabello restaurant where you can revel in a private dinner. 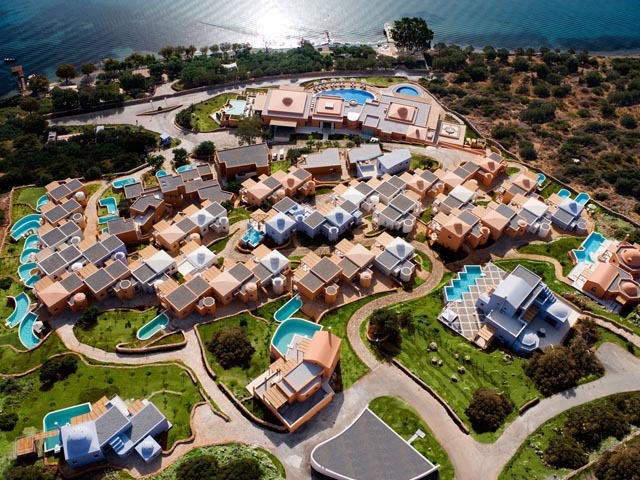 The Aquila Elounda Village is located in Elounda. LCD Flat-Screen TV technology in all rooms with 26 inch. Situated on the ground and second floor of the main building these room types are furnished with a king size double bed, marble bathroom and terrace with a magnificent garden view. The elegant interior design with its wooden furniture and olive green or blue and white nuances buckrams and curtains add to the uniqueness of this hotel. Total size 28m2 (including terrace / balcony). Max. occupancy 3 persons. Consisting of one bedroom and a terrace / balcony overlooking the sea or the gardens, these bungalows are beautifully designed with exclusive wooden furniture in blue and white for sea view bungalows and olive green for the garden view nuances, buckrams and curtains and en - suite marble bathroom. Total size 28m2 (including terrace / balcony). Max. occupancy 2 persons. 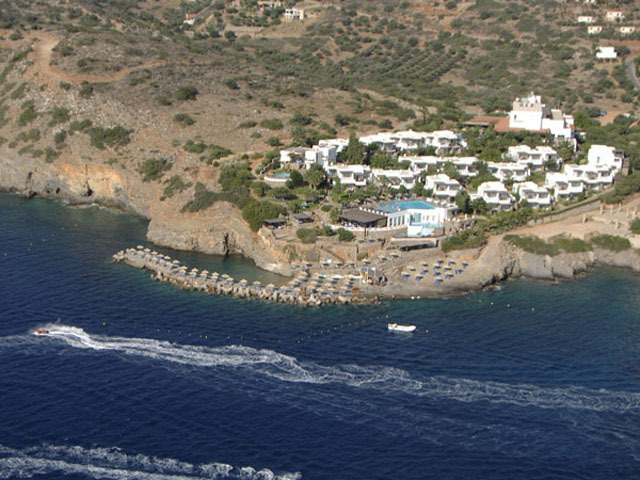 Situated on the ground floor and well placed amongst the gardens of the Elounda Village these bungalows comprise of a King size bed and have terrace / balcony overlooking the sea or gardens. The interior decoration is dreamlike and consists of canopy bed, floor candles, wireless phone, discrete room lighting, sofa for two and outdoor candles for the balcony. Total size 31m2. Max. occupancy 3 persons. 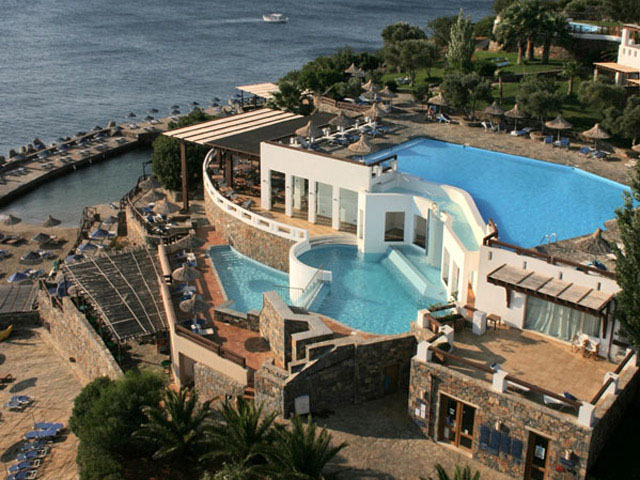 Situated on the second floor of the Main Building these room types consist of a bedroom with King size bed and marble bathroom, and a balcony overlooking the Elounda Gulf. Main building Superior sea view rooms are elegant designed with exclusive wooden furniture - blue and white nuances, buckrams and curtains. Total size 45m2 (including balcony). Max. occupancy 2 persons. Situated on the ground floor and well placed amongst the hotel gardens of the Elounda Village, these elegant Suites consist of one bedroom and an open - plan lounge with couch, en - suite marble bathroom, and a balcony overlooking the Elounda Gulf. They are elegantly designed with exclusive wooden furniture in blue and white nuances, buckrams and curtains. Total size 53m2 (including balcony). Minimum / Maximum occupancy 2 adults & 2 children. Situated on the first floor overlooking the Elounda Gulf these family bungalow suites have one master bedroom and a Living Room, en - suite marble bathroom with separate shower and two balconies overlooking the sea and the marvellous Mirabello Bay. Beautifully designed with exclusive wooden furniture and with blue and white nuances, buckrams and curtains. Total size : 34m2 (including balcony). Maximum occupancy 2 persons. These superior bungalows consist of one bedroom and balcony with sea view. They are stylishly designed with exclusive wooden furniture in colonial style, nuances, buckrams and curtains in earthy colors , en-suite marble lined bathroom with bathtub and separate shower cabin. Total area: 46m2, Terrace: 50m2, Pool: 20m2. Maximum occupancy 3 adults or 2 adults and 2 children. 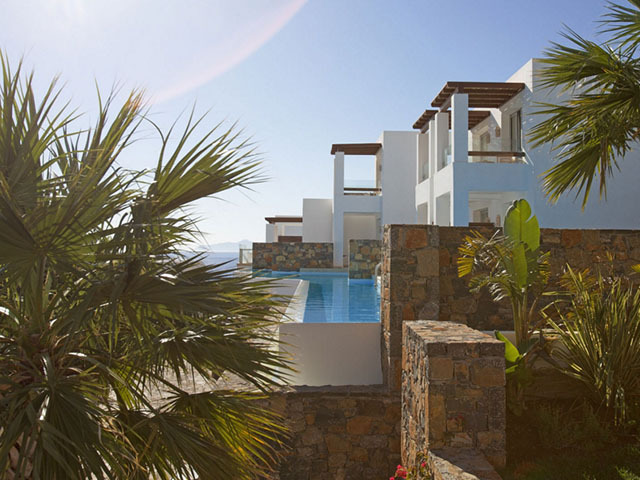 Stylish interior design situated on the costal line of Mirabello bay with endless sea view. The ground floor is consisting of a large sitting area with sofa beds which are serving as an extra bedroom for children and one bathroom. The spacious outside area has a wonderful garden with colourful flowers and is perfect for families who wish to relax with a breathtaking sea view. 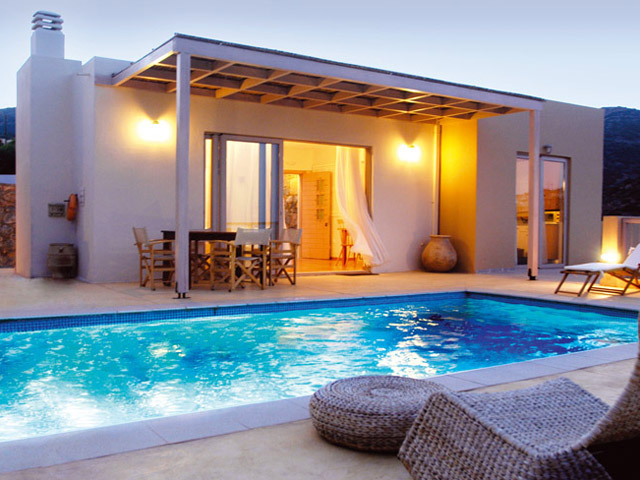 A private terrace with bamboo furniture and a private outdoor swimming pool. The first floor is consisting of one main bedroom, a marble lined bathroom spacious balcony with exclusive wooden furniture. Total size 53m2 (including balcony). Max. occupancy 3 persons. 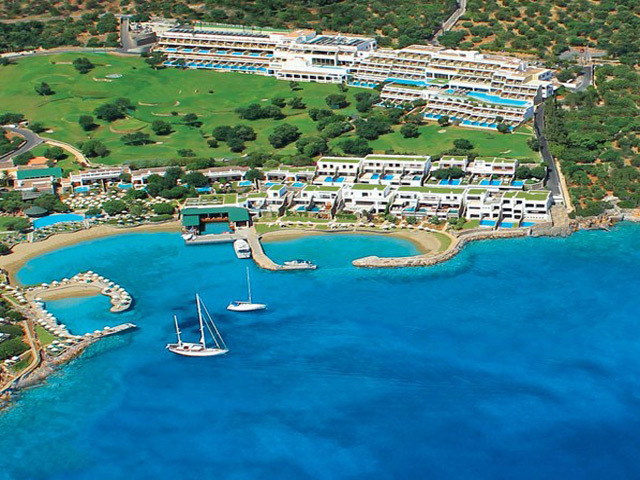 Situated on the first floor in selected areas overlooking the Elounda Gulf. These delightful accommodations comprise of one master bedroom and a living room with a couch that can be converted into a Bed of 1,80 dazzling, en - suite marble bathroom with separate shower and two balconies overlooking the sea and the marvellous Mirabello Bay. They are beautifully designed with exclusive wooden furniture - blue and white nuances, buckrams and curtains. rejuvenating packages, customized, depending on our guests' personal needs. fitness room and a hair salon. 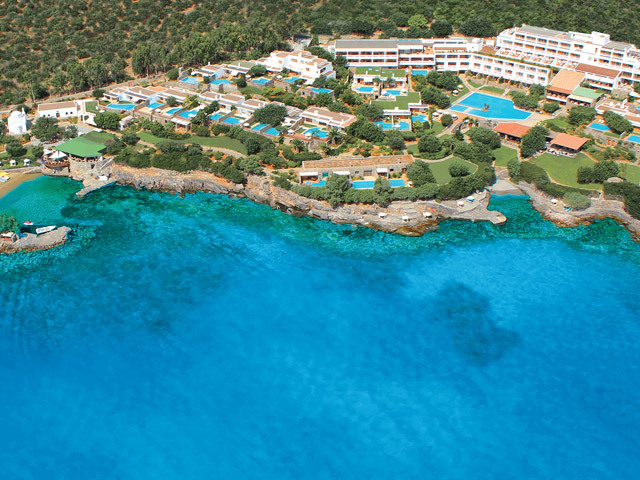 There are 3 seawater swimming pools and 2 decorative pools in the Hotel. Beach Size : Length 15m, Width 23m. There is thin sand throughout. Use of Air Conditioned high-tech Gym (equipped with CYBEX facility). 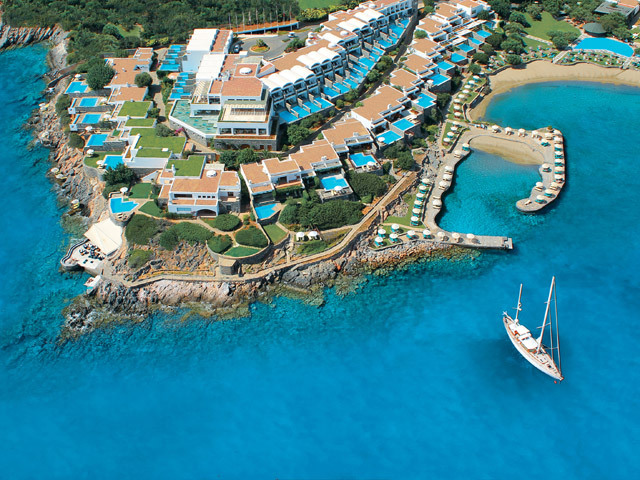 Golf (the hotel is member of The Crete Golf with priority status to the court bookings .Distance 48 km). Choose from the following restaurants and dine around. The Main Restaurant serves American buffet breakfast 07.15-10.30 and continental for late risers until 11.00.Enjoy full buffet dinner with active live show cooking station 18.30 - 21.00 pm. Local and international cuisine. The Mirabello a la carte restaurant is open for lunch 12.00-16.00 and transforms dinner from a meal to a dining experience. A superior selection of Local and Mediterranean delights. Open from 19.00 - 23.00. The ala carte restaurant Symposium is open from 19.00 - 23.00 and serves original Greek and Cretan specialties. Dress Code:Gentlemen are kindly requested to wear long trousers in all hotel departments during the evening. Candle Lit Dinner in the intimate luxury of your room terrace or close to one of the swimming pools or at the beach with an extra charge.